[miau] You are here because you want the scoop on the Fortunes Of Sparta Slot Machine. Well, we’ve got it. Spartan themed slot machines have been getting more popular and are starting to pop up everywhere. The Fortunes of Sparta Slot Machine might just prove to be one of the best and here is why. First lets take a look at what it is. This Ancient Greece based slot machine is fairly new. It is powered by Blue Print Gaming Software and is available to play on several online gambling websites. Fortunes of Sparta is well designed. Its graphics are well drawn and visually pleasing. Spartan soldiers, sailing ships, swords, stone temples and more make up the slot images. Every spin is a colorful and captivating display. This game has a 5 reel, 20 payline setup. It also features the Spartan Streak. When you spin, if a spartan helmet stops on the middle reel, then the Spartan Streak is triggered. This causes the helmet to expand and the reel turns wild. After the center reel turns wild the other four reels respin. Any winning symbols are frozen in place. The rest of the reels continue to respin until no more winning combinations are made. The free spins feature is another thing that makes this game great. When 3 or more bonus icons stop on your slot reels the free spins are triggered. 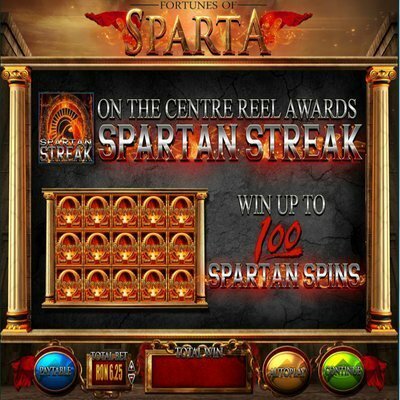 Once it is triggered any bonus symbols that land on your reels during the free spins are kept in place. If you collect at least 3 bonus symbols you win additional free spins. You have the chance to win up to 100 free spins. Another pleasing feature is that the expand Spartan Wild remains active on the middle real, increasing the chance to win even more. The downside to Fortunes of Sparta is that it is currently only available for play to some countries. This is an inconvenience to certain people. There’s nothing like getting excited about a game only to find out it’s currently unavailable in your country. Don’t worry though Fortunes of Sparta slots is still a fairly young game and will become available to more countries in the future. My conclusion is: If you like to play slots you will enjoy the high payout chances and visually pleasing aspects of this Virtual Slot Machine.